EMPOWERING CREDIT EXECUTIVES TO CREATE VIABLE JOBS Credit energises the markets that create and sustain commercial and industrial growth. T3P LIMITED and Associates provide counterparty risk management resources to businesses operating globally. BarrettWells Credit Resources (BWcr) specialises in aiding Credit Executives to develop creative solutions and confidently underwrite transactions thereby nourishing and sustaining their own and their Counterparties' businesses. The Chameleon in the Room is available in Paperback and eBook/Kindle versions; use the links below to purchase your copy. 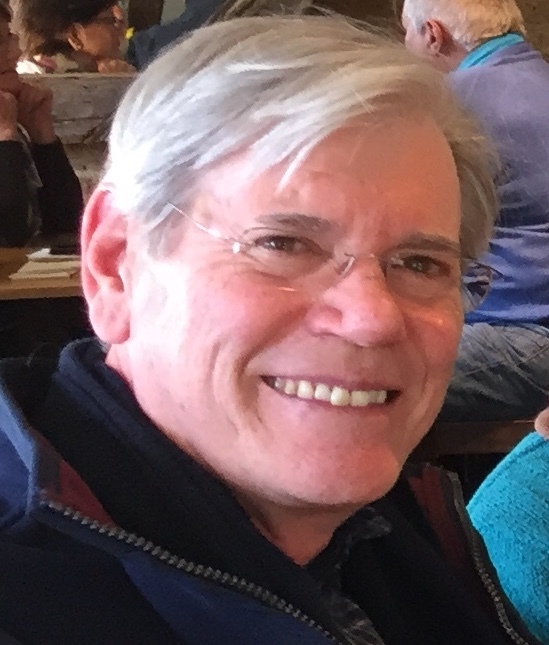 It is unusual as it provides tools specifically designed to manage risks that are often ignored by executives; the same risks that have surprised and fatally wounded many giant enterprises, and countless SMEs. It particularly addresses the concerns and responsibilities of Executive Directors, Non-Executive Directors, ‘C-Suite’ Executives, SME Executives and Start-up Entrepreneurs. Click here to look inside the book and read an extract from chapter three. Paperback and Kindle eBook versions are available from Amazon.com, Amazon.co.uk, Amazon.ca and Amazon.de, Amazon.fr, Amazon.it, Amazon.nl and Amazon.es. Kindle eBook versions are available from Amazon.co.jp, Amazon.in, Amazon.au, Amazon.com.mx and Amazon.br, and available from several European online bookshops. 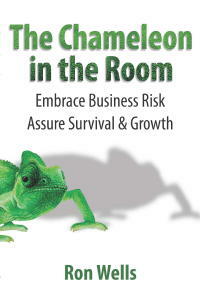 The Chameleon in the Room is a must-read for those managing risks! The writer looks beyond the obvious, makes comparisons across cultures. He ‘slices’ the concept of risk in fragments and does describe the obvious but, even more important, explains the non-obvious. It makes you re-think, challenges you to look at things from a different perspective, and provides tips and direction, based on actual events. In short, very practical and a must-read for those engaged in the management of risks. Recommended to everyone who wants to deal with business risks successfully! I always had a feeling that knowledge of the theory is only one part. Another, much more difficult one is finding a way to apply it in practice. Reading The Chameleon in the Room resolved majority of my doubts concerned with risk management. Written by a practitioner for practitioners the book shines the light on the areas left by theories in dark, and gives clear guidance for everyday practice. I recommend this book to everyone who wants to deal with business risks successfully! April 27, 2014: Good book, easy to read and very useful. The book is a very good addition to my current study in credit management and I would recommend it to any credit manager or professional who wants to become credit manager. The book is written in a nice way and the subjects are short, but concise, which makes it easy for a study. To purchase your own copy at Amazon.co.uk click here. Alternatively shop at Amazon.com for a copy by clicking here. This book is great for those risk professionals, who have hands-on responsibilities in commodity trading and that have realized that academic books are well short of the real day-to-day work. He illustrates his explanations with the daily life of a credit and collateral management team in an oil trading company, mirroring those decisions and actions that require solutions from those who, like the author, have experienced and solved real credit, defaults and near default incidents. Good fun; I will get the print edition to keep on my desk for reference. 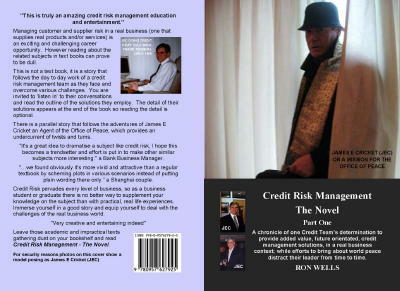 The printed and/or Kindle eBook versions of Credit Risk Management – The Novel (Part One) are available from eStoreT3P, Amazon.com and 11 country specific Amazon websites; Amazon.in (India), Amazon.com.br (Brazil), Amazon.com.mx (Mexico), Amazon.co.jp (Japan), Amazon.co.uk (UK), Amazon.fr (France), Amazon.de (Germany), Amazon.it (Italy), Amazon.es (Spain), Amazon.ca (Canada) and Amazon.com.au (Australia). The printed version can also be purchased through the CreateSpace eStore. Alternatively place your order with your favourite bookstore today. The ISBN 13 (International Standard Book Number) is 978-0-9576279-2-5.